The ChemReveal LIBS Desktop Elemental Analyzer offers direct chemical analysis for virtually every element in virtually all solid materials. 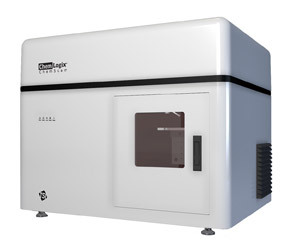 Built with advanced laser-induced breakdown spectroscopy (LIBS), the ChemReveal is the ideal instrument for fast elemental analysis when chemistry may be unknown. It's helpful for pre-screening and easier to use than many other methods. ChemReveal measures organic elements (C, H, O, N), truly light elements (e.g. Li, B, Be, Na, Mg), and heavy metals simultaneously. With high-resolution imaging of samples and computer-controlled sample manipulation, the ChemReveal enables detailed spatial and depth profiling of solid samples. It's perfect for use on probing films and coatings. Designed for laboratory use, with both basic- and advanced-level user interfaces, the ChemReveal LIBS Desktop Analyzer is optimal for researchers, scientists, and test technicians who are looking to quickly assess the element composition of solid samples. ChemReveal comes equipped with detailed spectral investigation, customer-built and pre-loaded libraries/calibrations, and ChemLytics™ software that supports method development. ChemLytics provides the tools you need for the classification and quantification of elements and chemical properties in your materials. For advanced users, ChemLytics Plus™ software works with industry-standard chemometric software that creates multivariate models for quantification in complex matrices, and library matching for challenging positive material identification.